Anne Adams (left) and Ann Sharpe show the shirts they designed as part of their senior project at Bexley High School. Although both have graduated, they are continuing to sell the shirts in hopes of raising money to construct a school in the Ethiopian village of Debre Birhan. Luis La Torre, Anne Adams, Ann Sharpe, Susana Madrid. But with substandard housing, no nearby schools, and little access to safe drinking water, hope can be dim for the people of this small, African village. Enter 2012 Bexley High School graduates and longtime friends Anne Adams and Ann Sharpe who want to change that by helping to raise $10,000 to help build a K-12 school there as part of The Community Project: Ethiopia. It all started about a year and a half ago when Adams and Sharpe were at an Easter brunch at a family friend’s house. There they learned of Angelique Smith’s recent trip to Debre Birhan with Habitat for Humanity. Upon their departure, Smith and the rest of the team promised they would find a way to build a school, community center and community garden for the village. “We had no idea about what we wanted to do (for our senior project) until Angelique told us about her trip,” said Adams, who was a junior at the time. But after hearing of the promise, the project seemed like a perfect match. Adams and Sharpe have been together in Bexley since preschool. Their on and off again friendship became solidified in middle school, and they have been buddies since. So they understand the importance of both education — and friendships. “There are 500 homes around this village, but there is no school,” Adams said. “Many of the children have to leave the area and go live with others if they want to get an education. Both Adams and Sharpe admit they have had a considerable amount of help along the way and they are thankful for it. In the end, the girls sold some15 shirts, raising about $225. But they knew they wanted to do bigger and better things. Come June, diplomas in hand, they pledged to continue with their senior project, adding a web page and an online store, which goes live this week, in order to boost sales and put them closer to their $10,000 goal. “Ann and I hope to travel to Ethiopia and help build the school eventually,” said Adams who will be attending the College of Charleston in South Carolina this fall. Sharpe will attend Ohio Wesleyan University. Neither is sure about a major yet. But one thing is for certain, ‘pia has proven to be a real learning experience for both, and one that will continue to offer rewards in the years to come. “We made strong, meaningful connections with each person, which made the idea of ‘pia that much stronger,” said Sharpe. “Annie (Adams) and I both never wanted to ‘guilt’ anyone into helping us or donating. However, we found that people genuinely wanted to go above and beyond and either share their knowledge and sometimes donate to the cause. 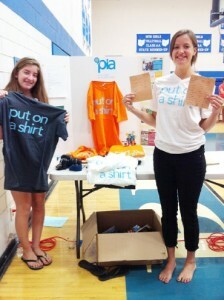 To learn more about the project in Debre Birhan or to purchase a T-shirt, visit www.4pia.org.